Photos by Wiebe Nijland (top left), Joel White (bottom left), and Angeleen Olson (right). Bottom right: seagrass laver (Smithora naiadum) growing on eelgrass. Eelgrass is a perennial seagrass species. Its branching, flattened stems grow to 2.5 m long, and bear alternating dull green blades. These blades grow to 1.2 m long and 12 mm wide, have rounded tips, and are marked by 3-7 longitudinal veins. Eelgrass may be submerged or partially floating in water. Eelgrass forms "meadows" in muddy and sandy substrates from the low intertidal zone to a subtidal depth of 6 m. It prefers protected shorelines, subtidal flats, and estuaries, as well as tidal pools along more exposed shores. Its west coast range stretches from Alaska to Mexico; it is also found along shorelines of eastern North America, Greenland, Europe, eastern Asia, and North Africa. 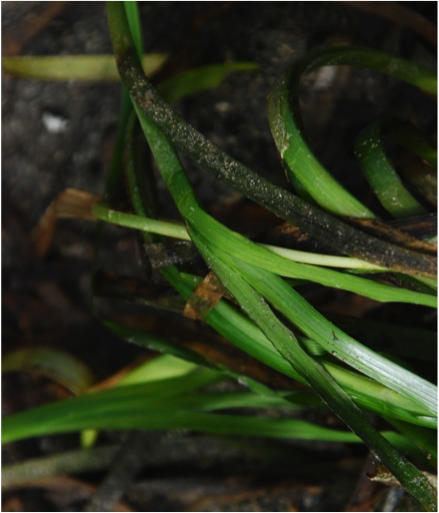 Dwarf eelgrass (Zostera japonica) is a thinner and shorter seagrass species, found higher up in the intertidal. As its scientific name indicates, it is an introduced species from Japan. Scouler's surfgrass (Phyllospadix scouleri) has thinner blades and its stems are usually unbranched . Serrulated surfgrass (P. serrulatus) has toothed leaf margins that can be felt by running a finger along the edge of the leaf. Torrey's surfgrass (P. torreyi) has thinner, wiry blades. Surfgrasses in general tend to be a brighter or more vibrant green, and grow on rocks in more exposed habitats. 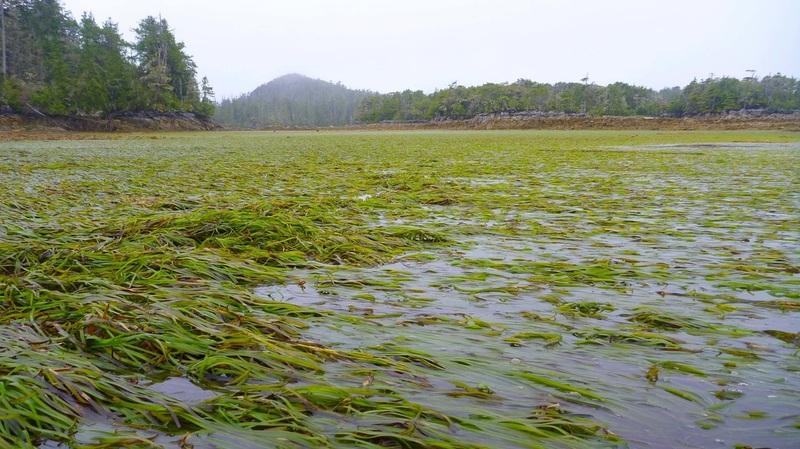 Eelgrass is a traditional food source for multiple coastal first nations groups, including the Salish, Nuu-chah-nulth, Haida, and Kwakwaka'wakw. The rhizomes and leaf-bases were the preferred parts for some groups, while the Haida preferred to eat eelgrass with herring spawn attached. Other traditional uses for eelgrass from around the world include as material for basket and blanket weaving, thatching for roofs, insulation, and paper fibre. 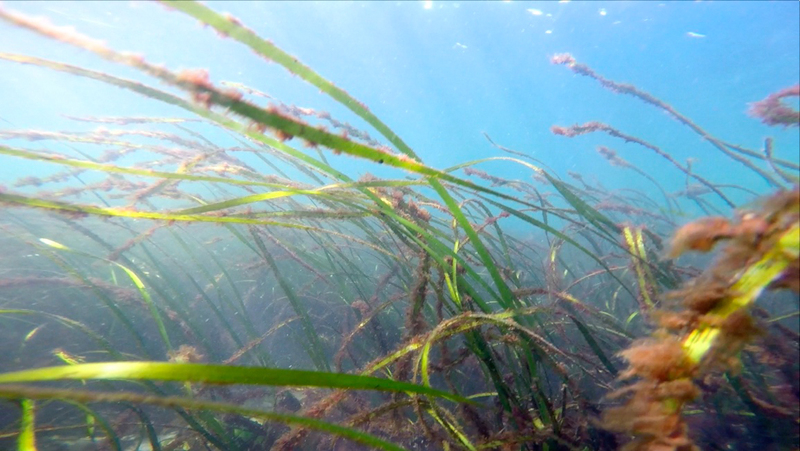 Eelgrass is a source of food, shelter, and sediment stabilization for its own as well as neighbouring ecosystems. It provides nursery habitat for numerous species, including juvenile salmon, herring, sole, perch, and smelt, as well as habitat for various other fish, invertebrates, and mammals. Eelgrass is also a common substrate to which herring spawn attaches. Microorganisms attach to the blades as well; by breaking down dead plant matter into detritus these microbes provide food for numerous species, and form the basis of countless food webs. The root system and rhizomes play an important role in settling sediment and stabilizing muddy and sandy substrates. 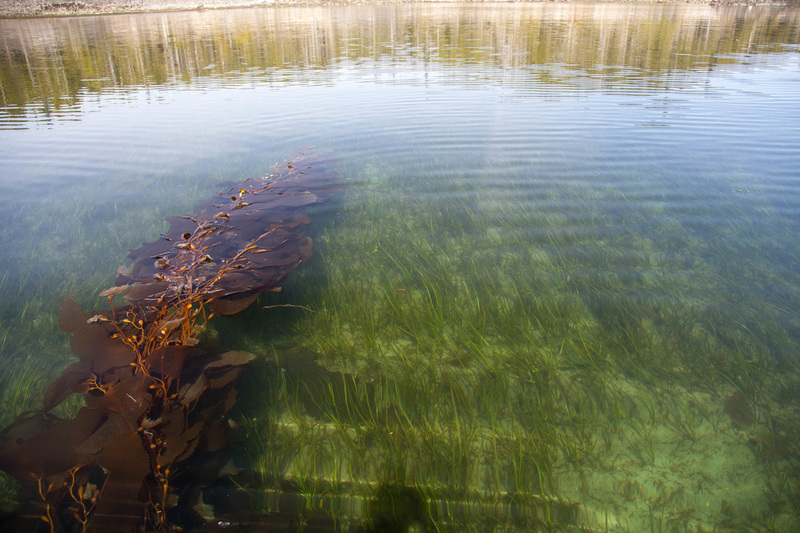 Click here to read more about eelgrass, its importance in coastal British Columbia's ecosystems, and how human activities such as dredging, seawall construction, and pollution threaten eelgrass beds. Click here for the Eelgrass Bed Mapping atlas in the Community Mapping Network, used to manage mapping data for eelgrass beds in British Columbia. Capital Regional District. (2014). Eelgrass. Capital Regional District Education & Outreach. Victoria, BC. Accessed 23/01/2014. Harbo, R. M. (1999). Whelks to whales: Coastal marine life of the Pacific Northwest. Madeira Park, BC: Harbour Publishing. P. 212. Lamb, A., and Hanby, B. (1999). Marine Life of the Pacific Northwest. Madeira Park, BC: Harbour Publishing. P. 212. Zostera Marina L. In Klinkenberg, Brian. (Ed.). E-Flora BC: Electronic Atlas of the Plants of British Columbia. Lab for Advanced Spatial Analysis, Department of Geography, University of British Columbia, Vancouver. Accessed 23/01/2014. Pojar, J. and MacKinnon, A. (1994). Plants of Coastal British Columbia. Vancouver, BC: Lone Pine Publishing. P. 345.